It’s often been commented upon that Survival was a story that pointed towards the style adopted by NuWho. Like some of the early NuWho stories, there’s a sense that the story is located in a real, definable modern location. Other Who stories of the time (such as Silver Nemesis) were also set on contemporary Earth, but Survival takes us onto the streets and into the tower-blocks of contemporary London, a place where the series rarely ventured. It’s also possible to imagine the story working very well as a 45 minute story (like the majority of NuWho). Had it done so, then the majority of the first 25 minutes could easily have been jettisoned. There’s some nice moments, such as Ace’s friend Ange who’s surprised to see her as she thought she was dead (“either you were dead, or you’d gone to Birmingham”) but far too much of the episode drags. The business with Hale & Pace as well as the Doctor faffing around with the cat food is all pretty throwaway stuff. But we do get to meet the arrogant Sergeant Paterson (“Have you ever heard of survival of the fittest, son, eh? Have you ever heard of that? Life’s not a game, son. I mean, I’m teaching you the art of survival. I’m teaching you to fight back. What happens when life starts pushing you around, son, eh? What’re you going to do then?”). The constant repetition of “survival of the fittest” during the first episode is a far from subtle foreshadowing of what was to come. It’s interesting that Survival is a very episodic story (The Keys of Marinus is another where the location would change from episode to episode, but I can’t think of many other examples from the original series off the top of my head). Episode one takes place on Earth, episode two on the planet of the Cheetah People whilst episode three returns us to Earth. Episode two is probably the best of the three. The Cheetah People’s planet is very well realised, with subtle video effects used to change the colour of the sky, etc. It’s certainly a good deal more effective that the garish Paintbox effects on Mindwarp. I also love Dominic Glynn’s music here – so it would be nice if SilvaScreen restarted their release programme of Doctor Who soundtracks with stories like this one. And the Master’s back! 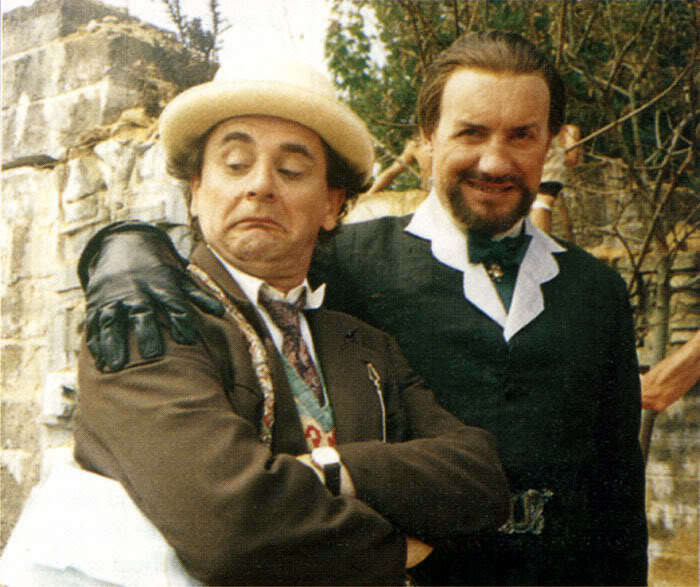 Although his interpretation wasn’t to everybody’s taste, I’ve always had a soft spot for Anthony Ainley (and considering how the New Series has treated the Master, Ainley is a model of restraint). Survival is probably his best Doctor Who appearance as the Master (although his best appearance overall as the Master can be found on the links of the Destiny of the Doctor CD-ROM game). For once, he has no grand scheme – like everybody else he’s just fighting for survival. But once he returns to Perivale, things do fall apart. The sight of the Master recruiting a gang of teenagers from the local Youth Club is bizarre, to say the least, and his motivations at the end of the story seem confused. At one point, he tells the Doctor that he has control over the power and that he’ll use it to destroy him. 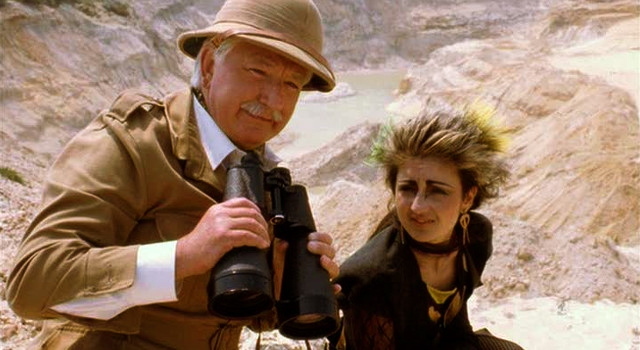 In the very next scene, the Master and the Doctor are back on the planet of the Cheetah People and the Master’s attitude has completely changed – now he wishes to die, as he doesn’t want to live as an animal. As happened so often, script editor Andrew Cartmel seems to has overlooked plot-holes like this, which would have been easy to fix. Although it’s not really visible, the Master’s murder of Karra (Lisa Bowerman) is quite vicious and serves as a reminder that he could be ruthless when the situation demanded it. Karra is the Cheetah Person who forms a strong link with Ace. 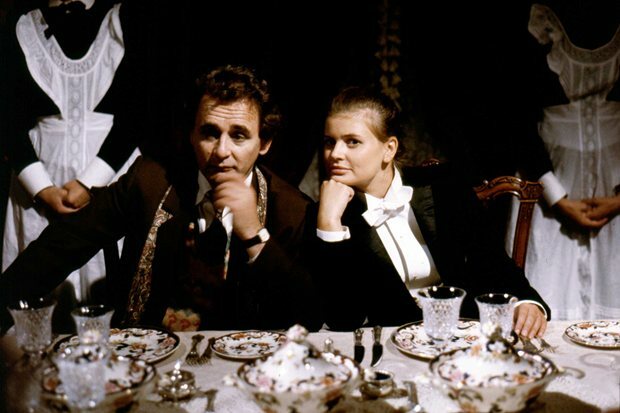 And Ace’s prominent role in the story is another link to NuWho, where the companion is often more important to the story than the Doctor (although Survival is not unique in this respect – and in fact this is the last in a loose trilogy which put Ace to the fore). Whilst Ghost Light was the last story from the original run to be recorded, Survival was the last to be transmitted and it’s really the end of an era. Doctor Who would survive – initially as books, then a one-off TVM, then audios and then finally the relaunched series in 2005 which achieved levels of success (in the UK and also worldwide) both commercially and critically that the original series only enjoyed somewhat intermittently. The Curse of Fenric is a bleak, cynical story. So it’s hard to believe that, for many people at the time, Doctor Who was still seen very much as children’s television – although some of the performances, which we’ll come to later, did have a feel of “children’s tv” about them. One of the interesting things about Fenric is how it portrays the British during their darkest hour. The government are seen to hatch a plan which will cause mass slaughter in Russia at some unspecified point in the future. It doesn’t go as far as to say that Churchill knew about it, but the implication is there. MILLINGTON: Oh, that’s the beauty of it, Doctor. We won’t detonate it. They’ll do it themselves. They’ll use the machine to decrypt our ciphers, but Doctor Judson has programmed it to self-destruct when it tries to decrypt a particular word. And, once the political climate is appropriate, we will include the word in one of our ciphers. As the above extract indicates, there’s a little confusion in the scripting. At one point, Millington (Alfred Lynch) discusses how the chemical weapons could signal the end of the war – but he plans to use them against the Russians, not the Germans, so how is this possible? Faith is an important part of the story. The Reverend Wainwright (Nicholas Parsons) doesn’t have faith any more and it proves to be his undoing. I remember the outcry amongst a certain section of fandom back in 1989 when Parsons’ casting was announced – it seemed that another Ken Dodd comedy turn was expected. But Parsons was wonderful as the conflicted Wainwright (not that this should be a surprise, since he had plenty of acting experience). He has some lovely moments in the story, such as this scene with Ace. ACE: Funny church, this, isn’t it? ACE: Things always look different when you’re a child. ACE: Don’t you believe in anything? ACE: The future’s not so bad. Have faith in me. But sadly he didn’t have faith in her or anyone else, so he meets his end at the hands of Jean (Joann Kenny) and Phyllis (Joanne Bell). They’re two of the weak links in the story – they’re not particularly impressive before they’ve been taken over, but afterwards they’re somewhat diabolical. Maybe it’s the fingernails or the stilted delivery, but it’s not good. There’s better acting elsewhere though. Dinsdale Landen has a nice touch of humour as the wheelchair-bound Judson and is even better when taken over by Fenric in the last episode. But it’s a pity that episode three didn’t end on a close-up of him, rather than a shot of the Doctor looking mildly worried (but it’s not the first cliff-hanger of the era to end on a limp shot of the Doctor by a long chalk). Fenric was always a story that didn’t quite work in its original broadcast format and both the VHS and the DVD had different edits which benefit the story by including various scenes that had to be cut out due to time restrictions. There’s possibly too much plot in the story for the episode count – the Haemovores, the Ancient One, Millington’s agenda, the Russian’s plan to steal the Ultima machine, the return of Fenric, it’s certainly all going on. Losing a few of these threads (particularly the Haemovores who contribute little to the plot) would have tightened things up a little. And episode four, whilst it has some great drama (especially when Sorin has been taken over by Fenric) can’t help but feel like something of an anti-climax. It is a little hard to take Fenric that seriously when he wants to drop everything to pick up the game he was previously playing with the Doctor. Yes, I can see that chess is a metaphor – but it’s a somewhat clumsy one. The scene where the Doctor attempts to destroy Ace’s faith in him is nice though – and it’s either a skillful weaving together of plot-threads from various stories during S24 & S25 or an opportune scramble to explain some of the plot-holes from those same stories. I’ll leave you to decide. DOCTOR: Do you think I didn’t know? The chess set in Lady Peinforte’s study? I knew. DOCTOR: I knew. I knew she carried the evil inside her. Do you think I’d have chosen a social misfit if I hadn’t known? She couldn’t even pass her chemistry exams at school, and yet she manages to create a time storm in her bedroom. I saw your hand in it from the very beginning. DOCTOR: She’s an emotional cripple. I wouldn’t waste my time on her, unless I had to use her somehow. I’ve never quite understood how Ace never twigged that the baby was her mother. Did she not know her maternal grandparents or did she just think it was a strange coincidence that Kathleen and her husband had exactly the same names as her Nan and Grandad? And the less said about the “Sometimes I move so fast, I don’t exist any more” scene the better, I think. Not a perfect story then, but there’s enough going on to make it a worthwhile, if sometimes flawed, watch. 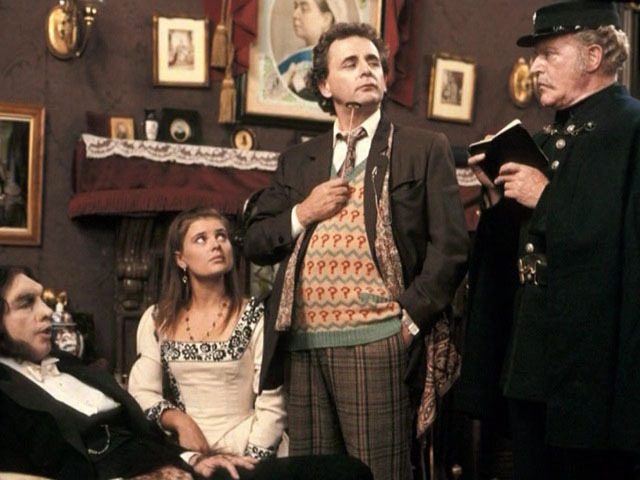 Ghost Light is definitely a story that’s bursting with ideas, although it could be that there were simply too many ideas and concepts for three episodes – as over the years many people have complained that the script is incomprehensible. For me, whilst there are holes in the plot (although it’s hardly a unique Doctor Who story in that respect) the main thrust of the story and the performances have always been more than enough to draw me back to it. And often when re-watching, I’ll pick up on another aspect that I’d previously overlooked. There are other Doctor Who stories from the original run which can be said to have rich subtexts buried under the visible plot-lines (Warriors’ Gate and Kinda for example) but these were pretty much the exception that proved the rule – generally Doctor Who stories from 1963 – 1989 operated on a very linear level. Ghost Light doesn’t always adhere to this. Most of the answers are there (although you sometimes have to read between the lines) but some questions remain unanswered. For example, if we accept that Josiah was one of Light’s specimens who managed to escape from the stone ship in 1881 and sent the house’s owner, Sir George Pritchard, to Java, how has he managed to evolve so quickly? The evidence indicates that he was barely humanoid when he emerged (the husks) so it’s difficult to understand how he could evolve into a Victorian gentleman in a matter of a few short years. And how could Nimrod have evolved from a Neanderthal into the perfect butler during the same short space of time? Some of these points probably explain why Ghost Light has remained a frustrating experience for some, but for me the first rate cast more than makes up for these unanswered questions. It’s probably the best-cast McCoy story. Ian Hogg (a familiar face at the time from Rockliffe’s Babies) is wonderful as Josiah, managing to turn from menacing to pitiful at the drop of a hat. Sylvia Syms has more of a one-note character for the majority of the story, although she does have a moment of tenderness in episode three (ironically just before Light deals with her). Katharine Schlesinger has a very fresh-faced appeal as Gwendoline. 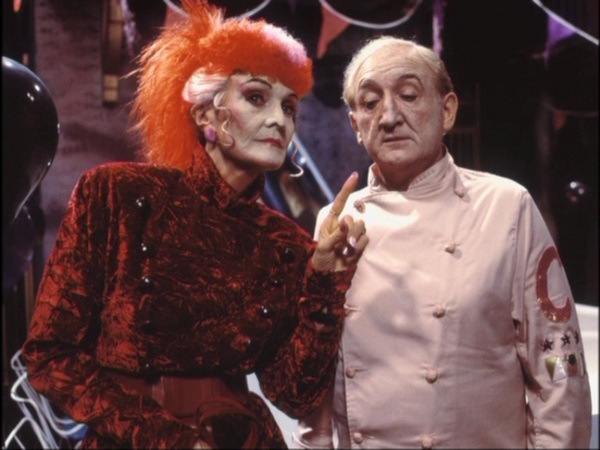 Although she and her mother were both under the control of Josiah, the Doctor delivers a rather chilling verdict about her, “I could forgive her arranging those little trips to Java, if she didn’t enjoy them so much”. Michael Cochrane, Frank Windsor, Carl Forgoine and John Nettleton all add to the overall quality of the cast and the demise of Windor’s Inspector Mackenize gives us one of the great sick jokes of the series (“The cream of Scotland Yard”). Sharon Duce is, interesting, as Control. It’s certainly a performance that’s somewhat at odds with the rest of the cast, but although she’s initially off-putting it does work better after a few re-watches. John Hallam is surprising fey as Light, but as with Duce it’s an acting choice that, after the initial surprise, does work. Following Battlefield which didn’t do McCoy and Aldred any favours, they’re both back on top form in this story. With the Doctor deciding to take Ace back to the place where the ghosts of her past linger, this does put the spotlight on Aldred, which she’s more than able to deal with. Maybe it was the studio environment or possibly the good actors around him, but McCoy’s at his best here. The clip below shows just how good McCoy could be. It’s slightly frustrating that he was rather inconsistent from story to story, but when he was good, he was very good. If Light is defeated a little easily at the end (an occupational hazard of portraying powerful figures – the more powerful they are, the more of an anti-climax when they’re dealt with. See Sutekh for another example of this) it’s possibly more important that the Doctor has cured Ace of the lingering trauma she felt about the events of 1983. 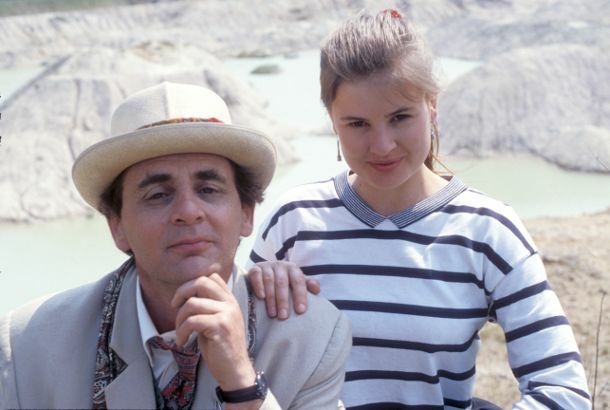 From the moment we met her in Dragonfire, it was clear that Ace was something of a damaged character – and this is another example of the Doctor subtly sorting out her psyche. See also The Greatest Show in the Galaxy where he cured her fear of clowns and more seriously the upcoming Curse of Fenric where he attends to the tricky problem of her mother. It’s possible to argue that the Doctor shouldn’t really be doing this, and it’s certainly not something he’s done before, but then he’s never really had a companion with quite so many problems as Ace. And her journey is all the more remarkable when you consider that Aldred only appeared in 31 episodes. 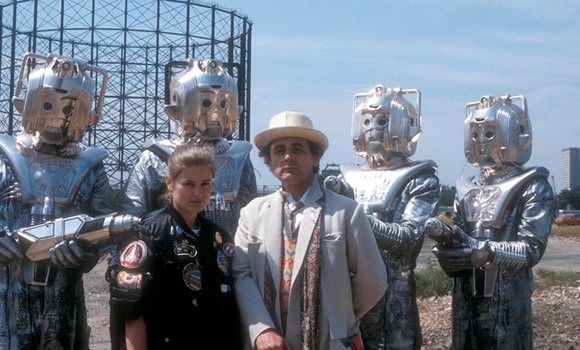 Many companions have enjoyed far greater episode counts but few had the sort of character development enjoyed by Ace. And her journey, central to this story, is one of the reasons why Ghost Light remains an outstanding example of late 1980’s Doctor Who. After the success of Remembrance of the Daleks it was inevitable that Ben Aaronovitch would be asked to contribute another script. 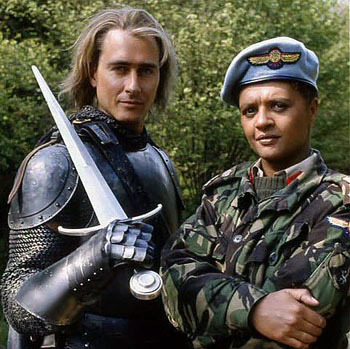 Battlefield began life as a three-parter which was later expanded to four episodes, although Aaronovitch was to express his dissatisfaction with the story as it appeared on screen – feeling that it too obviously a three-part story with an extra episode bolted on. But whilst there are script problems, there are also some rather dodgy performances which do drag the story down. 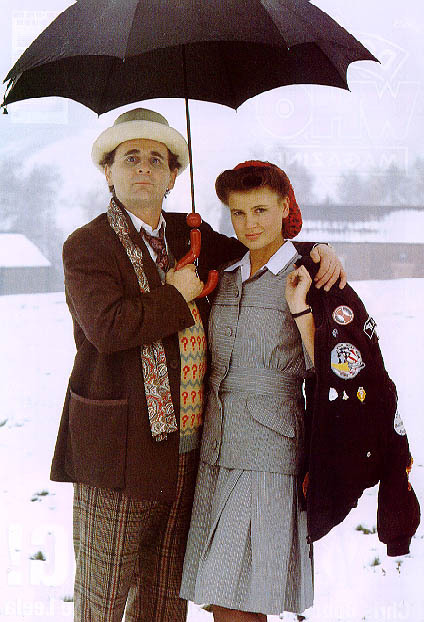 It’s probably (apart from Time and the Rani) Sylvester McCoy’s worst Doctor Who performance. He’s all over the place and far too many times his line delivery is very poor (“There will be no battle here!”, ” If they’re dead”, etc, etc). Comparing this and Ghost Light back to back is particularly instructive. He’s at his best in Ghost Light (restrained and still) and very much at his worst in Battlefield (ranting and over-expressive). Sophie Aldred has her poor moments as well (“Boom!”) whilst Christopher Bowen’s turn as Mordred is on the ripe side, to put it mildly. Angela Bruce settles down as the story progresses, but she’s also not especially good to begin with (“Shame!”). It’s not all bad though – Marcus Gilbert has a nice comic touch as Ancelyn and James Ellis is always watchable. His Tennyson ad-libs (“ Thou rememberest how, in those old days, one summer noon, an arm rose up from out the bosom of the lake clothed in white samite, mystic, wonderful, holding the sword“) work very well and it’s nice that Michael Kerrigan allowed him some space to indulge himself. 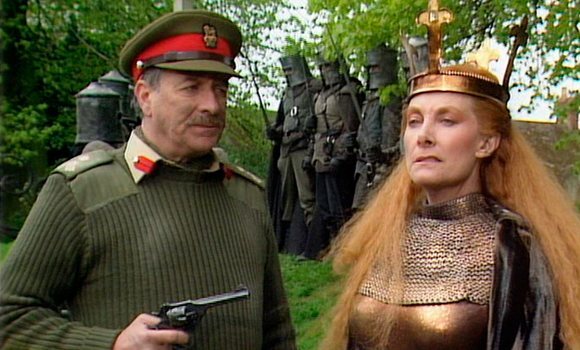 The main guest roles were filled by Nicholas Courtney and Jean Marsh. Marsh manages to bring out the contrary nature of Morgaine, as she’s someone who is more than capable of destruction but also has her own moral code (observing remembrance for the dead and restoring Elizabeth’s sight). Ben Aaronovitch was quite clear that bringing back Lethbridge-Stewart and UNIT was something of a fannish indulgence. In many ways this undoes some of the good work from Mawdryn Undead. It would have been the easy option in 1983 to have the Brigadier back with UNIT and fighting monsters, but instead they went for a more interesting story with a retired and somewhat broken-down figure. Here, it’s pure fannish wish-fulfillment to have the Brig back in his old uniform and in charge (albeit temporarily) of UNIT. It’s hard to believe, to be honest, that any military organisation would reinstate a retired soldier like this, so it may have been more credible to have had him along as a civilian advisor, due to his knowledge of the Doctor. Courtney’s always good value (especially when facing down the Destroyer in the last episode) but after Mawdryn, this can’t help but feel like a little bit of a let-down. As with many stories script-edited by Andrew Cartmel, some interesting material never made the screen (although it was restored for a special edition of the story when it was released on DVD). Chief amongst the cuts was the disdain that Ace has for the Brig, something that is totally absent from the transmitted story. The story is a little incoherent with various plot devices (a stranded nuclear missile convoy is introduced in the first episode and then forgotten about until the last ten minutes of the final episode) not used particularly well. And the reason for Morgaine traveling to this universe is never made clear – has some catastrophe affected her own, maybe? The plot is a little wooly at times, it’s made clear that Morgaine knows she’s traveled to another dimension, but at another point in the story the Doctor maintains that the Earth will be a battleground for a conflict that doesn’t belong here – implying that Morgaine is unaware she’s no longer in her own universe. The reveal of the Destroyer at the end of the third episode does give the story a little more impetus and it has to be said that the design is wonderful. Some seven years earlier, the Terileptils in The Visitation were able to curl their lips but that’s nothing compared to the lip-curling that the Destroyer indulges in. It’s a good indication just how animatronics and technology in general had evolved over the course of seven years or so. Flawed though Battlefield is, it’s still enjoyable – but it’s very much the weak link in S26. And a special mention must go out to the closing scene. Keff McCullough’s comedy tune as the girls leave is perhaps a fitting ending to a real curate’s egg of a story. The Greatest Show in the Galaxy was originally slated for S26 as a studio-bound three-parter. It was brought forward to form part of S25 and the episode count was upped to four – with an allocation for location filming. Although the location work took place in a quarry (not an unusual location for Doctor Who) – Warmwell Quarry in Dorset was something special. Visually, it looks stunning and the production was fortunate to have good weather, which along with the setting really helped to give the early part of the story an epic feeling. When the planned studio sessions had to be cancelled due to an asbestos scare, the production set up shop in the car park at Elstree studios. It wasn’t always easy, but there was a feeling that this story was something special, so nobody wanted it to go the way of Shada. There are two main themes that Stephen Wyatt develops across the tale – the first is that clowns are somewhat sinister and the second is that you should never trust a hippy. By his own admission, Wyatt was never a free-spirit during the 1960’s and his distrust for the “free-love” generation is clearly on show. And what is Deadbeat, if not a warning about what happens if you do lots of drugs? The founders of the Psychic Circus (including such far-out characters such as Flowerchild, Peacepipe and Juniperberry) had a dream to forge a real workers collective. According to Bellboy, “We had such high ideals when we started. We shared everything and we enjoyed making people happy. If we had a problem we’d all just sit round and talk it through. Oh, we were so happy. At least, I think we were”. But something went wrong. Somehow the Gods of Ragnarok infiltrated the circus and it became a killing machine for their personal pleasure. Are the Gods (with their constant cries of “entertain us”) designed to parody the television audience or are they poking fun at the BBC management who seemed to be increasingly indifferent to Doctor Who? Although I never got to see the early days, I know it’s not as good as it used to be but I’m still terribly interested. It’s hard to see how anyone could possibly dispute this, as by the late 1980’s it was common practice for the majority of Doctor Who fans to hark back to the glory days of the 1960’s and 1970’s and despair of the direction the current series was taking. As an aside, I love the comment on the audio commentary when Jessica Martin asks if any fans were offended by this character and Toby Hadoke responds that Doctor Who fans have a default setting of being offended! Whizzkid isn’t the only odd character drawn to the circus. There’s also Captain Cook (T.P. McKenna) and Mags (Jessica Martin). The Captain and Mags seem to have been written as a pastiche of the Doctor and Ace – another aspect of the story which is feeding off itself to create story ideas. McKenna gives a lovely turn as the amoral, boorish explorer and Martin is very appealing as his side-kick. A definite Doctor Who companion that never was, I think. Greatest Show has some lovely imagery (the clowns driving in a silent hearse, for example) and a strong guest cast. There’s nice cameos from the likes of Peggy Mount and Daniel Peacock whilst Ian Reddington shows exactly how clowns can be creepy. Given that S25 generally portrayed the Doctor as a cosmic schemer, this story is very much the odd one out. He fails to sense that there’s anything wrong at the end of the first episode (whilst Ace can hear Mags’ screaming) and he also doesn’t pick up on the signs that Mags is a werewolf. As Captain Cook says, “You really were extremely stupid this time, Doctor”. Although there’s plenty to enjoy in Greatest Show, it might have been better off as a three-parter after all. The story virtually grinds to a halt in episode three and episode four is also a bit of a disappointment. The resolution happens very quickly, so it probably would have been better to have a more coherent ending and slightly less of the Doctor’s conjuring tricks. It was no doubt good fun for McCoy, but the finale should have been a little more involving than simply some business with eggs, rope and straightjackets. But even though the story rather dribbles away, the visual sweep, performances and the story ideas make up for the limp ending. The Greatest Show in the Galaxy? Mmm, at times I’d probably say it was. The Doctor is custodian of an ancient Gallifreyan artifact of almost unimaginable power. One of the Doctor’s oldest enemies wants it (as do others) and after various adventures they acquire it. But far too late they discover that they’ve fallen into the Doctor’s trap. Sounds familiar? It should do, since it’s the plot of Remembrance of the Daleks. And then a month later exactly the same story was used in Silver Nemesis. It’s hard to believe that Andrew Cartmel would have commissioned two writers to pen the same story, so presumably it was a coincidence. But when the similarities became apparent, Silver Nemesis really should have been rewritten. To be honest, Silver Nemesis really isn’t very good. It’s similarity to Remembrance is only one of its problems. I’ve always found the notion that the Doctor set his pocket watch to remind him that the Nemesis statue would crash to Earth in 1988 to be bizarre. He has a time machine, so why didn’t he nip forward 350 years as soon as he’d launched the statue, in order to deal with the consequences? And the scenes with the skinheads are particularly painful. Why keep them in, since they don’t advance the plot at all, when other cuts were made which did impact the narrative? The story would have probably been better as a four-parter, or a re-drafted three-parter, but what was transmitted was a bit of a mess. The VHS edit (incorporating some of the cut footage) was an improvement – but the DVD only had the broadcast version. If ever a story needed a re-edit, then it was this one – but sadly the DVD didn’t get it. The Cybermen aren’t much cop (there’s a train of thought that posits it was all downhill for them after The Tenth Planet). Even the briefest touch from a golden arrow is enough to kill them (whereas in Earthshock the Doctor had to grate Adric’s batch into their chest unit) and even worse, they run away when they spot gold on the ground. As Ace would say, wimps! Anton Diffring adds a touch of class as De Flores. It’s not much of a part (he’s the leader of an inept bunch of neo-Nazis) but he does what he can. 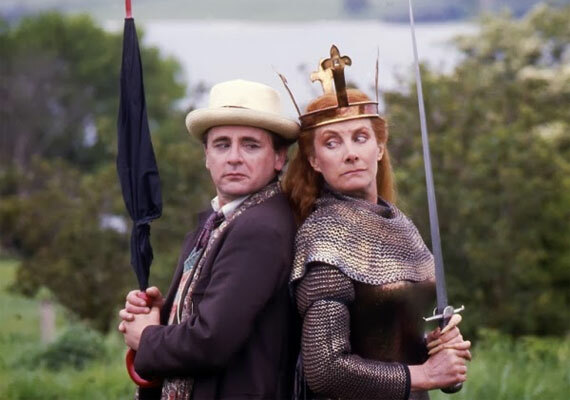 Fiona Walker makes a fairly forgettable villain, although Gerard Murphy as Richard gives a nice, comic performance. Silver Nemesis is also notable for dropping hints about the “truth” concerning the Doctor. All this “more than a Time Lord” business was covered in depth later in the New Adventures, which was probably the best place for it. This story is a perfectly inoffensive 75 minutes, but as its sandwiched between two stories that have considerably more scope and depth, it can’t help but look a little threadbare. The Happiness Patrol is one of the greatest Doctor Who stories of all time. That’s not possibly a view that’s particularly widely shared (it ranked only 172 out of 241 stories in the DWM 2014 poll). But then The Gunfighters could only manage a ranking of 202 in the same poll, which is even more bizarre. After watching The Happiness Patrol on its orignal transmission back in 1988, my first thought was that it was like Paradise Towers – only done right. There’s a lot to enjoy in Paradise Towers, but some of the performances do let it down. Happiness is cast so well, with no weak links. Sheila Hancock is Helen A, an autocratic leader who has little time for anybody else’s point of view. Saddled with an apparently subservient husband, Joseph C (Ronald Fraser), they were seen at the time as obvious caricatures of Margaret and Denis Thatcher. The tone of Hancock’s delivery, for example, is clearly modeled on Thatcher. Hancock told DWM in 2001 that she hated Mrs Thatcher “with a deep and venomous passion” so it’s not surprising that she took the material in the script and pushed it, possibly, even further. But though Helen A can be seen as a Thatcher-clone, the script is pointing in another direction. Take the final scene between Helen A and the Doctor. HELEN: They didn’t understand me. DOCTOR: Oh, they understood you only too well. That’s why they resisted you. HELEN: I only wanted the best for them. DOCTOR: The best? Prisons? Death squads? Executions? HELEN: They only came later. I told them to be happy, but they wouldn’t listen. I gave them every chance. Oh, I know they laughed sometimes, but they still cried, they still wept. Helen A had been running a reign of terror, with mass murders, referred to as “disappearances”. Whilst Margaret Thatcher had many faults, “death squads and executions” weren’t amongst them. This aligns Helen A and Terra Alpha much more with countries such as Chile, where political opponents of the military junta in the 1970’s also “disappeared”, never to be seen again. Helen A has some loyal soldiers to call on – such as Daisy K (Georgina Hale) and Priscilla P (Rachel Bell). Both Hale and Bell are great value, Hale’s drawling style of delivery can make the most out of even fairly mundane lines, whilst Bell is given some good scenes which highlight exactly how much of a fanatic she is (and just the type of solider Helen A requires when things turn desperate). PRISCILLA: I used to work with explosives when I was in Happiness Patrol B, the anti-terrorist squad. We worked the night shift. I like working late at night. PRISCILLA: Night times are when they come out. PRISCILLA: The killjoys. Depressives, manic reactive indigenous. We got them. All of them. ACE: What do you mean, got them? ACE: You make me sick. John Normington (Trevor Sigma) and Lesley Dunlop (Susan Q) had both guest-starred in S21, but had very different roles here. Trevor Sigma is a much less showy part than Morgus (Trevor Sigma exists only on the periphery of the plot and his major contribution is to confirm exactly how many people have disappeared on Terra Alpha in the last six months). Dunlop is much more central to the action and gives a very nice, understated performance (which isn’t easy in that costume). In episode one she discusses the futility of her life and how she welcomes the possibility of her own death – something that it’s hard to find many examples of in the series, prior to this story. But I did wake up one morning, and suddenly something was very clear. I couldn’t go on smiling. Smiling while my friends disappeared, wearing this uniform and smiling and trying to pretend I’m something I’m not. Trying to pretend that I’m happy. Better to let it end. Better to just relax and let it happen. I woke up one morning and I realised it was all over. Ronald Fraser has little to do throughout the story except react to other characters (although his final scene is a gem). But Fraser’s lovely as the befuddled consort and he adds another touch of class to the story . Richard D. Sharp (Earl Sigma) is very solid and provides a good foil for McCoy’s Doctor, which leads us onto the most controversial aspect of the story. 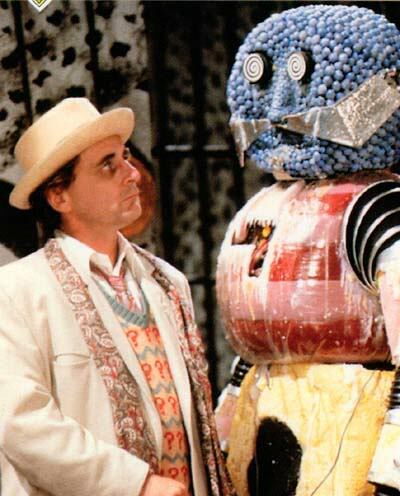 Yes, the Kandyman looks like Bertie Bassett. For those who can’t get beyond that, The Happiness Patrol is clearly a disaster. But the Kandyman is a wonderful creation – visually he looks great, he’s got some killer lines and despite the heavy costume, David John Pope gives him a definite character. And there’s a fabulous relationship between the Kandyman and Gilbert M (Harold Innocent). Virtually every scene they have together is laugh-out-loud funny, starting with the first when Gilbert returns to the Kandy Kitchen and the Kandyman angrily asks him “What time do you call this?“. I also love this exchange in episode two. KANDYMAN: What’s affected me? Help me! GILBERT: It’s quite simple. Created as you are out of glucose based substances, your joints need constant movement to avoid coagulation. KANDYMAN: What do you mean? GILBERT: You’re turning into a slab of toffee. I saw this at the planning stage, and then I realised what the solution was. The Kandyman does rather fade out of the story after episode two though. He only has one good scene in the last episode before meeting a rather sticky end. So whilst many people, I’m sure, would have been happy if he had fewer (or no) scenes, when re-watching the story I’m always disappointed he doesn’t have more. The Doctor and Ace are in the thick of the action. Ace gets to make friends with Susan Q and the Pipe People, as well as tangle with Helen A’s pet, Fifi. Aldred continues to impress, especially since given her inexperience she’s always mixing with actors who have had much more experience than her – but she more than holds her own. McCoy has several stand-out moments – the final scene with Helen A and the encounter with the two snipers in episode two (“Why don’t you do it then? Look me in the eye, pull the trigger, end my life. Why not?”). This is a defining moment for the Seventh Doctor, which McCoy pulls off very well. As previously mentioned, when he downplays, McCoy’s very effective. The notion of the Doctor initiating a regime-change during the course of one night does seem a little unlikely, so it’s best to suppose that the rebellion was already well under way and the Doctor’s arrival was simply the spark that lit the flame. There’s very little that I can find fault with – although I do wish that it had ended on the pull-back shot of Helen A comforting Fifi. That seemed to be the ideal ending – and the typical good-bye scene with Susan Q and Earl Sigma that actually closed the story did seem like something of an anti-climax. It would have been the easy option to fill all the stories from S25 with old monsters, but thankfully with The Happiness Patrol they wanted to do something different and they certainly succeeded.